Please contact us directly if you would like any further information. Situated in the picturesque alpine village of Samoens with Flaine forms part of the Grand Massif Just 1 hour from Geneva. Chalet Giffre has a great location in the town. The original farmhouse in the village with a private courtyard and the village on your door step. Just 400m to the church square and Gondola. We are now in to our 14th Ski season our family run chalet has 6 bedrooms. log burning stove dividing the dinning area and the lounge area. We have a free bar before dinner offering beers, wines, and a few old favourites like G&T`s in front of the log fire. Fully catered service 6 out of 7 days, cooked breakfast, afternoon tea/coffee freshly baked cakes, 3 course evening meal and cheese board served with cold beers and wine. We could offer you spacious ensuite rooms in beautiful Chalet Madosa : the perfect base for groups of families or friends searching for a modern, spacious, central- Morzine, catered chalet within easy reach of the ski slopes. Split over 4 floors, the chalet offers masses of living space plus all of the comfort and little luxuries that our regular guests have come to expect. The 6 spacious bedrooms all have ensuite facilities and can sleep 12-18 people in comfort. Parking is available on site. •	Lift pass, lessons and equipment pre-booking service with reduced rates. We have 7 nights half-board available from 3rd February priced at £745pp (£567 for 3rd adult in triple room. )5 night stays are £640pp. Please have a look at our website www.alpine-adventure.co.uk for further details and contact us if you would like any other information. I have rooms available in our catered chalet Bois Prin near the center of Chamonix. Comfy sofas and great views from every window with wifi in every room. For the week of 2-9 February 2019 we can accommodate your party of 6 in our owner-managed luxury chalet in the Grand Massif ski area, 75 minutes from Geneva airport. We have four very comfortable en suite bedrooms. Maison La Cerisaie is a beautifully renovated 1830s farmhouse in the authentic French Alpine village of Sixt Fer à Cheval. The rooms are spacious, with a large woodburning stove and connected living, dining and TV areas. There's a luxury hot tub on our garden terrace with fabulous mountain views. Our 5* catered service includes delicious dinners, homemade cakes and cooked breakfasts prepared by our professional chef, and excellent wines and beers. Sixt's own ski area is 200m away, with restaurant, ski hire, pass office and ski school. We also provide flexible chauffered transport to and from 3 different gondolas 5-10 minutes away, which give access to the rest of the Grand Massif's 265km of pistes. This has a wide range of skiing for all levels of ability among spectacular scenery. A unique feature of Sixt is a picturesque 14km ‘home run’ - the Piste des Cascades - from the summit (in Flaine) to Sixt, close to our chalet. We'll help you arrange airport transfers, ski passes, equipment, lessons and anything else we can to make your stay as relaxing as possible. Our rate for your week is 670€ per person (c.£596 at today's rate), or 550€ (£489) for those staying 5 nights. And please don’t hesitate to contact us with any questions. 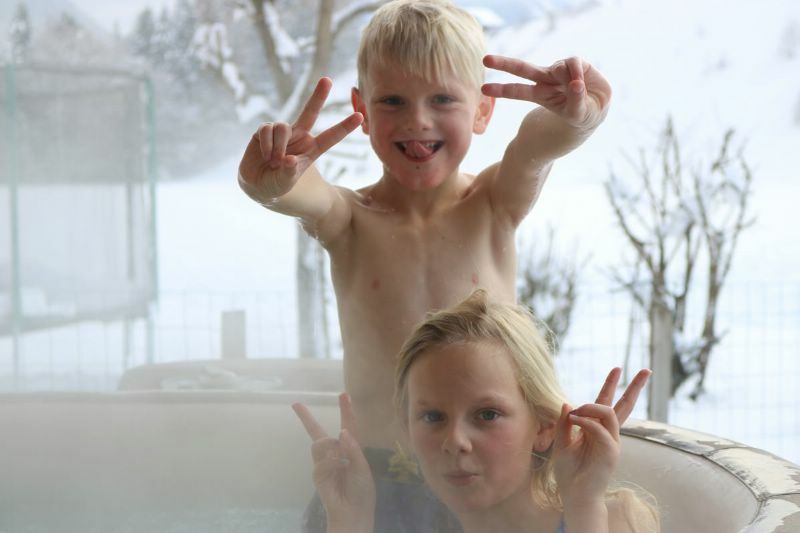 We have all the facilities you need to make your ski break enjoyable and comfortable. We have a large living room with real log fire,a separate dining room with flexible seating arrangements. With stunning views. We have a local airport transfer company that give our guests 10% discount. We take & collect you to/from the lifts if you can't ski back. Catered rate 100€ per person per night. We have availability in our chalet in Tignes and we can offer you a fully catered package including drinks. The chalet commands a fantastic scenic location overlooking the "Lac du Chevril" and is positioned approximately 700m from the ski lifts in Tignes Les Boisses, Espace Killy. You can also start your day from Val D’Isere. We provide minibus transport to and from the slopes and from the bars if you fancy some apres ski. You will have snow sure skiing in the high altitude Resorts of Espace Killy (Tignes and Val d'Isere). Our 5 bedroomed chalet is furnished to a high standard with a cosy atmosphere, log fire, balcony, and a lovely terrace with firepit to soak up the rays. Our fully catered package includes breakfast, afternoon tea with homemade cakes and a 4 course evening meal with local cheeses and carefully selected wines. We can help arrange transfers too and from the Airport or there is parking at the chalet if you decide to drive. Please take a look around our stunning Alpine Retreat....Chalet Soleil at www.alpinemajestic.com and please contact us directly for a fantastic offer. Also take a look at our outsatnding reviews on Trip Adviser to give you a great feel for what we are all about here at Alpine Majestic and the excellent services we offer to all of our guests. Geeski can offer you our luxury catered chalet Gros Pierrier in Chamonix-Les Houches, just 1 hour from Geneva Airport, from 02/02/19 - 09/02/19. Les Houches is located at the base of the Chamonix valley, offering great access to a range of varied ski areas. Each day we provide transfers between the chalet and any of the lifts in the area, so you can experience all that Chamonix has to offer. Chalet Gros Pierrier can sleep up to 12 across 5 bedrooms, 4 of these have ensuite bathrooms, whilst there is an additional separate bathroom for bedroom 5. There is a spacious living/dining area with fireplace, a sauna, heated boot room and table football table. From the chalet it is just a 5 minute walk to the nearest bar of Les Houches and a short bus ride into Chamonix itself. Price for this week is £648, and £600 for those staying Sunday - Friday. You can arrive/depart any day of the week and any time of day. Bags can be stored and there are shower/change facilities available on arrival and departure days so you can maximise your time on the slopes. We have two amazing chalets in a great location for you. One of the chalets offered above boast our premium service. Enjoy little extras such as an upgraded catering service with additional food and drink and upgraded chalet interiors for a more comfortable stay. We can offer the 02nd February 2019 for 7 nights from £625pp and 5 nights from £450pp at the Chalet Beau Soleil. To include return Geneva Airport transfers within operational hours (approx 1 hr 15). please contact me directly. if you consider tignes, i can propose my catered chalet. We are a Family specialist company operating successfully out of La Tania, Courchevel for 25 years, we can offer your family accommodation in one of our family chalets from 3rd to 10th February 2019. La vieille Ferme is a beautifully renovated Haute-Savoie Farmhouse in Les Vallons, Samoens, the only “listed” Alpine station de ski in France, which is part of the 256 kms of the Grand Massif ski area, 60 mins from Geneva airport. We are a family run property: Ann, myself, our daughter Bethan & her professional chef husband Lukasz. We can accommodate up to 14 people in beautiful ensuite rooms. All guests eat all meals in the main farmhouse kitchen next to the Aga & the open log fire. The quality of our evening meals & our Wednesday Fine Dining evening reflect our love of good food & wine. The Grand Massif offers an excellent snow record & a huge variety of skiing from 1600m – 2550m, ranging from gentle beginners to reds, blacks & off-piste, with an exceptional snow record. We can help organise Transfers, equipment hire, ski lessons, guiding, ski passes, with WiFi, dedicated games /TV room & our hot tub being available for Fully catered guests. All adding the final touches to the special experience available at La vieille Ferme. We are very confident that you would enjoy a stay with us at La Vieille Ferme. Come and visit a Snowchateaux chalet in the Alps and let us show you how a mountain holiday should be ! at the top of the chalet, large common room with dining space, sofa, fireplace, bar. possible to organise with my english partener for the transfert. with skipass 6 days - tignes val d'isère : 1050€.